Food and travel go hand in hand where I'm concerned. Experiencing the local culinary specialties gives me great insight into a region's culture and lifestyle. So to make the best use of my time when visiting a new destination, I often will schedule a culinary tour. To kick off my week-long stay in Budapest, I did that very thing. The tour started in the Great Market Hall--an sensory overload for those of us who love to touch, smell and taste food! My guide began with a tasting of a local liqueur called Unicum. Now let me first say that it was 10 am. But let me say next that we were not the only ones imbibing on this thick dark liquid that Hungarian's swear aids in digestion. Needless to say, I was quick to form the opinion that Unicum would have a hard time making its way to my kitchen shelf! Next we stopped to try another local favorite, langos. Langos is Hungary's most beloved street food. Basically, it is fried dough offered with various toppings (usually garlic butter, sour cream, and shredded cheese). Before leaving the market, I was handed a pogácsa--a bite-sized biscuit--hot from the oven. It was heavenly! There are several varieties including potato (krumplis pogácsa), cheese (sajtos pogácsa), cottage cheese (túrós pogácsa) and pork cracklings (tepertős pogácsa) are the most common types. 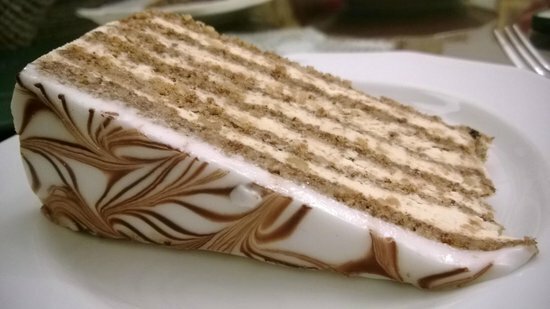 Pogácsa is sold at almost every pastry shop in Hungary and is often found served at wine bars and wineries. 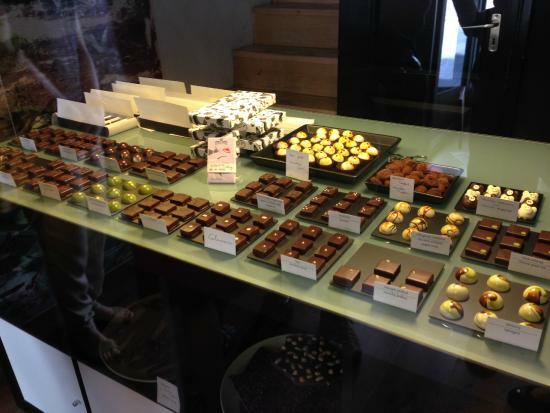 Leaving the market, we headed to the nearby chocolate shop, Rozsavolgyi Chocolate. These exotic little bonbons almost look too pretty to eat! But that didn't stop me! Here I tried some of the more traditional flavors like salted caramel and raspberry, but the real treat came from the unexpected flavors such as ancho chilli and lemon oil. The next stop was a traditional Hungarian restaurant. The place was small and a line of locals poured outside the front door waiting to get in to place lunch orders. Our guide ordered up several dishes for us to try--most I can't remember--but I know we started with a pumpkin soup that was delish!! The meat and potatoes were very good as well. The item I was most interested in trying was the pickled watermelon...and now I know I can scratch that off my list! Not a fan! The tour continued with a visit to a bakery shop where we enjoyed two Hungarian specialties: Dobos torta and Esterházy torta. 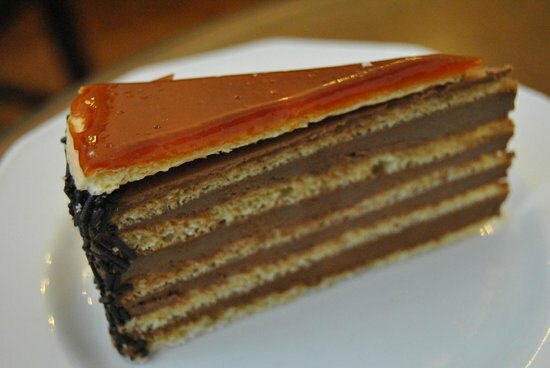 The Dobos cake is a sponge cake layered with chocolate buttercream and topped with crispy caramel; while the Esterhazy consists of several layers of vanilla spiced buttercream and topped with white fondant cream. One word describes this part of the tour: SWEET! The tour concluded with a wine and cheese tasting. Again, I don't know that I could recite all the wines (or local cheeses) we tried, but I was pleasantly surprised by all of them. The wines were exceptional and I ended up purchasing several bottles to take home. Sadly, Hungarian wines are almost impossible to find in the U.S. because their production quantities are so small. This food tour was one of the most fun (and sometimes daring in my mind--think unicum and horse salami) food tours I've been on! If ever in Budapest, I recommend taking one--it will be a filling and unforgettable experience. A lot of locals do their everyday shopping at the Great Market Hall in Budapest, but tourists (like me) who love food and architecture enjoy going to simply admire, sample and shop the three-stories of local specialties. The building itself is something to admire. The size is grand and the design looks more like an ornate historic train station than a food market. Each floor delights the senses offering anything from crafts, fresh produce, quality meats and salamis, fresh fish, food stands and cooked meals prepared to go. Some of my favorite items found in the Great Market Hall were the Langos (a deep-fried dough with various toppings), Hungarian paprika and Tokaj wines. Be warned, the market can get quite crowded. To avoid the crowds try visiting early mornings Monday through Friday. Baltazar Grill: Rarely does a hotel restaurant interest me--Baltazar is the exception. It was so good, we ate breakfast there every morning and returned for dinner on several occasions. My friend said the steak she had one night was one of the best she's ever had. I fell in love with the hamburger! Who knew I would love a hamburger halfway around the world so much? You can read more about my experience at Baltazar in an earlier post. Chef Cafe: I'm not sure which I enjoyed more at Chef Cafe, the food or the owner who ran everything on the floor from seating guests to serving food. He was ever so charming and the most gracious host! We felt like we were welcomed into his home. The restaurant is small and a reservation is a must (we saw several people without one turned away)--it's the perfect spot for a romantic meal! The food is strictly Hungarian, and very yummy! Zeller Bistro: This is a popular place! Even with a reservation, we had to wait nearly 30 minutes for our table. When we first walked in, the restaurant seemed small and quaint. Walking to our table, we realized there were many rooms in the back, including an enclosed courtyard where live music was being performed from a small stage. It was an eclectic and hip crowd, and the servers (who all seemed to be handsome and fit young men) were attentive and quite helpful with the menu. Zeller was a fun place to enjoy traditional Hungarian food prepared in a modern way. Ristorante Krizia: It's hard from me to stray too far from Italian food, so of course, when I learned about a good Italian restaurant in Budapest, I had to try it. It was a little quiet during my lunch visit with only a few tables occupied, but it's always a good sign when two of those tables were seated with Italians! And, as I had hoped, the food would make any nonna proud!